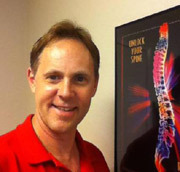 Dr. Dennis Robertson runs a referral-based chiropractic practice. We use this website to explain to Fresno-area residents what chiropractic is—and what chiropractic isn’t! Are you looking for a natural solution to headaches or back pain? Or perhaps ways to get well and stay well that avoid drugs or surgery? You’re in the right place! Because finding a qualified chiropractor in the Fresno-area begins and ends right here! Take the first step towards relief by calling our Fresno chiropractic office today. Countless other Fresno-area residents already have! Great job I felt better that night. Thanks! Great friendly staff. Very clean offices. The doctor is friendly and knowledgeable. My visits are extremely comfortable. Dr. Robertson is a great Doc and he has a great sense of humor. The staff are very knowledgeable and caring. I did not have to wait to see the doctor. I am so glad I found this doctor. Dr. Robertson really listens to what you tell him. He has a passion to help you! The most likable doctor I’ve ever known! Very good at listening and explains in detail everything which is important to me! Over all a good experience, I felt comfortable and felt somewhat better after just one Tx.